Who are we?! Come and find out! Art for the People is a boutique of visual & functional art that is located on the vibrant and quirky South 1st. Our building is easily identified by the butterflies and their metamorphic journey. Deanna Serra, owner of Art for the People had a vision to create a space for artists of all genres. We are fervent about promoting our Austin art community. As a boutique of the arts, we have 120+ artists in the form of original pieces of art, sculptures, ceramics, jewelry, home decor, cards, prints, and fashion. Art for the People Gallery is a contemporary art space and local artisan market whose purpose is to provide a platform to further and sustain the visual arts in Austin, Texas. Provide a space in Austin where all visitors can support and learn about the arts in an openly creative and dynamic environment. Showcasing local talent including artists, artisans, musicians, food makers and different people in the community. Support local businesses, non-profits, and causes through special events as well as raising awareness and fundraising. 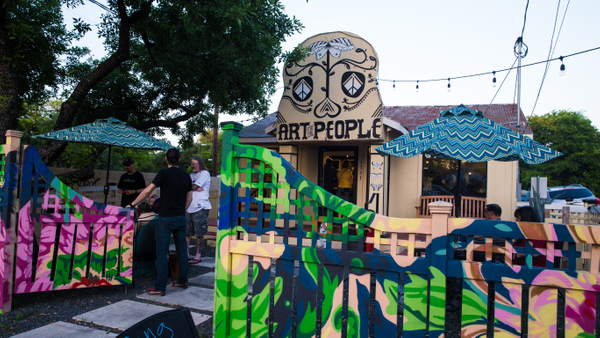 Located on South 1st, between Annie Street and Monroe Street, Art for the People is nestled into a neighborhood full of South Austin charm. The welcoming bell shaped front gate opens wide to invite guests into the front yard and onto the red patio space where garden furniture is arranged for socializing outdoors as well as enjoying the people-watching and old-Austin atmosphere. The upper gallery maintains the aura of the historic home with wood floors, and large windows. Three steps lead to the lower gallery, as does a ramp hugging the south-facing wall. High ceilings enhance the feeling of spaciousness and LED track lighting illuminates the entire gallery space. A site- specific art installation by Pierangela Bonatti on the ceiling of the lower gallery displays the “out-of-the- box” thinking that Serra hopes to represent throughout her space, creating a unique experience for the art lover. In the back, separated by a large barn door, is a workshop with large counter space, storage, kitchenette, and ample art storage. A state of the art sound system can provide music throughout the gallery. Ample parking is available and a ramp leads to a large two-door entrance in the back for large load-in’s.